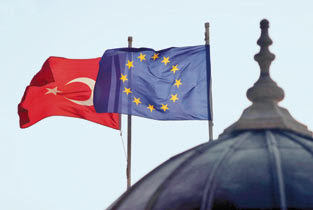 A clear majority of society supports Turkey’s bid to join the European Union, a new opinion poll has found. Public support for Turkey’s EU membership rose to 66.2 percent in this month, up from 55 percent in June of last year, according to a survey conducted earlier this week. The Social and Political Situation in Turkey survey, conducted by the Ankara-based MetroPOLL Strategic & Social Research Center on Aug. 4-5, surveyed 1,226 people across various provinces in Turkey to find out people’s views on a closure case against the ruling Justice and Development Party (AK Party), which concluded last month, and on an ongoing trial of suspected members of the terrorist organization Ergenekon, whose members are facing various charges over trying to topple the government. In response to a question on whether they would vote for or against Turkey’s EU membership if there were a referendum today, 66.2 percent said they would vote ‘Yes,’ while only 28 percent said they would vote against. In June of 2007 38.3 percent of those polled were against EU membership while 55.5 percent supported it. The poll supports the notion that the general tendency of the Turkish public is to increase support for EU membership in the face of processes perceived to be anti-democratic. In response to how they saw the ruling of the Constitutional Court, 27.6 percent of those polled said they were not pleased with the decision while 69.7 percent said they were happy with it. In response to a question on whether they thought the AK Party indeed threatens secularism in Turkey, 35 percent said yes while 60 percent said no. However, an overwhelming majority of 73.4 percent said the AK Party should change its policies in the future to avoid a similar situation, while only 22.6 percent said the party should stick to its past policies. However, optimism about Turkey's future was not high. In response to the question "In which direction overall do you think Turkey is headed?" 37.2 percent said Turkey will change for the better, while 58.2 percent said for the worse. The figures, however, mark a slight improvement from those in June, when 28.6 percent had expressed hope that things in Turkey would get better in the future and 66 percent had said they believed things would get worse. In response to a question on how the respondent would rate his or her sense of trust on a scale of 1 to 10 for various individuals and state agencies, the highest trust rating went to the military (8.7), followed by the police (7.7) , President Abdullah Gül (7.1), the judiciary (6.9), the Constitutional Court (6.7), Prime Minister Recep Tayyip Erdoğan (6.4), Nationalist Movement Party (MHP) leader Devlet Bahçeli (4.0) and finally CHP leader Deniz Baykal (3.1). Asked who they would vote for if there was an election today, 42 percent of respondents said they would vote for the AK Party, followed by the CHP (13.9 percent), the MHP (8.4 percent) and the DTP (1.8 percent). Of the remaining respondents, 12.5 percent said they were undecided, while 7.2 percent said they would simply vote a blank ballot; 3.8 percent said they wouldn't go to the ballot box at all, while 5.4 percent said they had no opinion. The poll was conducted Aug. 4-5 by telephone among a random national sampling of 1,226 adults residing in cities, towns and villages. The margin of error for the full poll is 2.5 percentage points, at a 95 percent confidence level. A Pawn in the Game?